The Alchemist Mouse is a breed of mouse found in the Tribal Isles region. They are known to drop Seashells in Cape Clawed and Elub Shore. 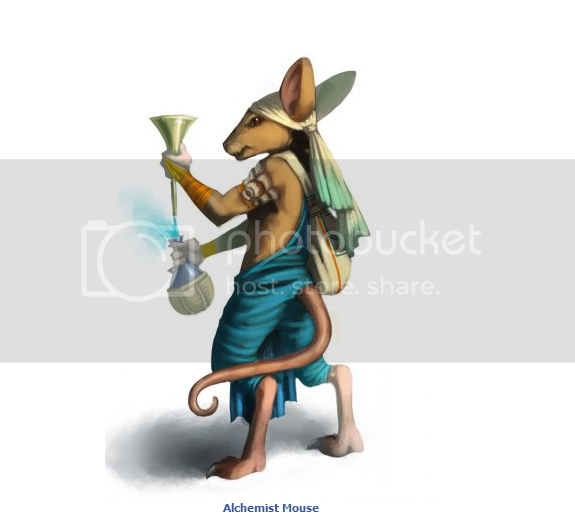 The Alchemist mouse of the Elub tribe uses scarce and secretive ingredients from the ocean to create an elixir of life which possesses grand healing properties. Alchemist mice have no specific preference for any kind of cheese. The weaknesses of the Alchemist mouse differ slightly from most of the others in The Elub Tribe. Hydro type weapons are very effective against it. In addition, unlike the others of The Elub Tribe, Physical and Tactical weapons are of normal effectiveness against it. All the other power types are ineffective.